“You have a dark side,” Eleanor Waldorf observed of her daughter in last night’s episode of the Show of Our Time, prompting Blair to embark on an ill-fated mission to behave “more like Grace Kelly, less like Grace Jones.” It’s fitting that Blair’s supposedly sinister alter ego would take the form of a disco queen, as Blair is probably, actually, the least dark person on the show. Even the flirtation with Jesus that followed her miscarriage was campy. Compare her to Serena, whose feelings of being unloved were proved right when she overdosed on a train, went missing for months without anyone noticing, and was subsequently dumped by her boyfriend after his teenage daughter, who hated her, sabotaged their relationship. 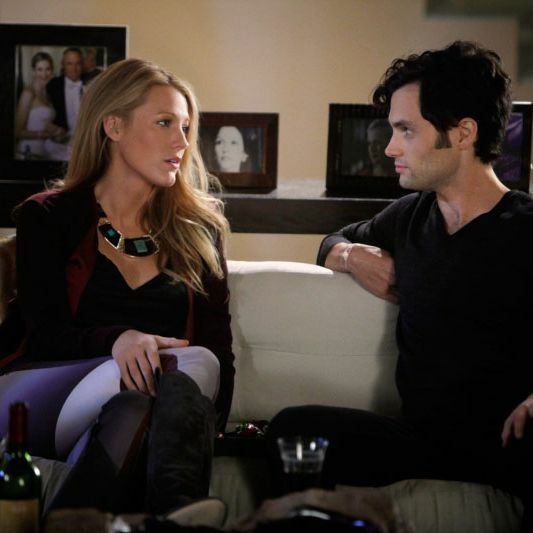 Or Dan Humphrey, who came to this show an innocent idealist and has morphed into a bitter, meanspirited jerk. Every time the camera lands on his face, we expect it to pan around and show that one half of it is a grinning skull, like Harvey “Two Face” Dent. And was anything darker than the scene at the auction, when three of the most disturbed souls on the show, Lily, Ivy, and Chuck, spent millions of dollars in a frenzy of trying to ruin each other’s lives, the favorite sport of the Upper East Side? And now, onto the reality index! “What is this, Downton Abbey?” Eleanor says when she walks in and sees the way Blair has lined up the atelier staff. Plus 2. We bet Eleanor secretly lusts after Matthew even though she married a Mr. Bates. “I’m just glad everything is out in the open,” Rufus says to Ivy. “And you had money to save the gallery from tonight’s opening.” Oh, Rufus. Not only has he remained “a kept man,” as Lily observes later, he’s still utterly unable to tell when the blonde he is sleeping with is a total liar. Plus 5. We all have patterns. Bart and his banker friend got the idea of where to stash their super-secret documents from the movie Traffic. Plus 4, because even billionaires wish they were as cool as Hollywood villains. “Chrystal and Cristal, two of my favorite things,” says banker guy. Plus 2 for nailing the caricature. How can someone who hides everything for everyone pick his birthday for his password? Plus 2 because, again. “Is Olivia Munn staying here?” Nate asks when he sees Chuck scrutinizing the hotel security tapes. Plus 1 because he wishes, that cougar-lover. Serena appears at breakfast clad in a nightgown, ancient Egyptian breast plate, and men’s smoking jacket. Doesn’t she ever just want to put on some jeans? No points taken, because then we’d have to go back and subtract them for all the other times she’s appeared in Breakfast Sequins. Similarly we will not deduct points for the continued denial of Scott, Lily and Rufus’s Secret Son From Boston, who has gone unmentioned since his arc ended four seasons ago. Sometimes I will be doing some ordinary activity and I’ll suddenly remember him and be like, “OH MY GOD, WHERE THE HELL IS SCOTT?” so it’s weird that never happens to them. If people get stuck in the elevator, they press the emergency button, pound at the doors, scream until they’re hoarse, and freak out about not having enough air. They don’t sit down and have heart-to-hearts. Minus only 2, because Dan and Serena have experienced this before. No points, but where is Georgina? She would have loved this auction. And are Sage and Steven just gone forever now? It would be great if, in the Christmas Special, all the Ghosts of Character Arcs Past came back to haunt the rest of them for their sins. The fifth-to-last episode of the Show of Our Time came out on the side of realism, largely because of the cringy authenticity of the Dan-Serena situation. Next week could take a steep dive, if they push the story line of him as her Mr. Big, and if Chuck and Blair break up forever AGAIN as indicated in the promo. We shall see! Xoxo.